She has got to be the world’s most exasperating woman! She won’t keep her cute little nose out of police business in general and my cases in particular. Okay, I’ll admit that when I decided to leave the Boston PD to return to my home town on Cape Cod to take the position of detective, the idea of seeing Gemma Doyle might have played some small part in my decision. Things between us didn’t exactly end on a comfortable note. I mean, how could they? Not many guys could live with a woman who seemed to be able to read their minds. I know I couldn’t. I can’t. And, so I left. Ran away, really and took the job in Boston. But I couldn’t stay away, and now, I’m back. She’s still here, still owning the Sherlock Holmes Bookshop and Emporium at 222 Baker Street, West London along with Great Uncle Arthur Doyle. They’ve added a restaurant next door at number 220. Mrs. Hudson’s Tea Room, they call it. Nice place, as is the woman in charge, Jayne Wilson. I remember Jayne from back in school. Gemma’s still here, and still interfering in police cases. Someone left something of value in her shop. Did Gemma hand it over to the police? Of course not. She had a better idea of trying to track down the owner and found herself wrapped up in a murder. Will she step back and let the police handle the investigation? Of course not. Don’t tell Louise Estrada, my new partner, this or my chief, but have to say Gemma sometimes does seem to have a point. I mean, she just knows things that others do not. I can only be glad she didn’t take up a life of crime. Elementary, She Read, the first in the Sherlock Holmes Bookshop series will be published by Crooked Lane on March 14. It’s now available for pre-order in ebook and hardcover formats. Contest time! 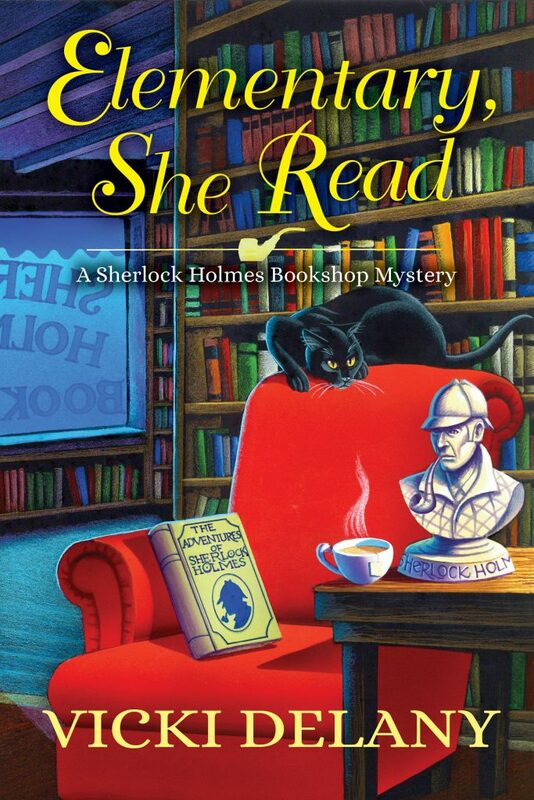 The Sherock Holmes bookshop series is set on Cape Cod, and Vicki picked up a few things on her spring visit. If you'd like to win this lovely Cape Cod recipe book and the little magnet with a painting the beach AND an Elementary, She Read Fridge magnet, please leave a comment. Vicki will give five runner-up winners an Elementary, She Read fridge magnet. Please leave your email (so we can contact the winner) for a chance to win. Contest closes Thursday am. Open to Canada and US residents. What a fun contest and series to look forward to. Spending time with someone who can read your mind might be a little tough. This looks like a fun book and thanks for the contest. I am a sucker for Sherlock and this looks like a book I would love. Like the idea of the series. I think I'd like to visit Cape Cod just to go to that bookstore. Thanks for the contest. I'm super excited for this book! Thanks for the chance to win! I love Sherlock and cozies. What a great combination! Sounds like a great read! Thank you for the chance! Sounds like a great new series to start reading!! I love anything Sherlock. Would love to win the recipe book also. Thanks for having this contest. Sounds really good. I look forward to it. Great sounding book! Thanks for the giveaway. Love the sound of this book! Can't wait to read. Great giveaway, the magnet would look be a great reminder on my refrig. Thanks for the chance. I love Sherlock Holmes. He was an amazing character. I am excited about this new series. Sherlock Holmes, my favorite. Would love to win the recipe book, Thanks for a chance. Great giveaway for some really cute gifts. Thank you so much for the opportunity to win them. I never win anything but I really would love this book package !!! seascapelife at gmail dot com . Thank you. Mystery book club. Sounds like fun! I look forward to reading this. Thanks for the great giveaway, too! Can't wait to read your book! Thank you for a chance to win! I'm a school librarian in San Francisco. My students will love hearing about this book. I've read every book Vicki/Eva has written and I can't wait for this new series! Hurry up March!!!! Thanks for the chance to win your giveaways. This sounds like a fun series, I have throughly enjoyed other books by you and look forward to this one. Super excited to read! I still love all of the Sherlock mysteries. Thank you so much for the chance in your generous giveaway. While I've never personally been to Cape Cod, I do enjoy reading about the locale. I'll look forward to reading more about Gemma and Detective Ryan on March 14th! I pre-ordered the Kindle version!